If you’re a die-hard Buick fan, and who isn’t? 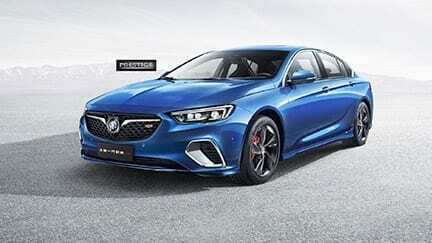 You won’t be disappointed behind the wheel of the new 2019 Buick Regal GS AWD. This version is a bit more pricey than the average Regal but the numerous amenities are worth it. Drivers can tailor your vehicle’s steering response, suspension and other driving dynamics based on road conditions — or your mood — with three interactive drive control settings: Touring, Sport and GS. Regal GS comes standard with the robust power and torque of a 3.6L 310-HP V6 engine, and a 9-speed automatic transmission that enables thrilling, responsive drives. Take a seat in the GS-exclusive racing-inspired seats that are massaging, heated and ventilated, and feature electronically adjustable lumbar and thigh support bolsters to help you customize your command of the cockpit. There’s a sportback opening that’s casually integrated into the GS design with the innovative rear sportback opening. When the rear seats are folded down, there’s plenty of wide, deep and spacious room that can hold plenty of stuff in all shapes and sizes. From exclusive 19” wheels to a Sport mesh grille with Piano Black finish, it’s all found in the details of the new Regal GS. Distinctive lower rocker panels, front air scoops accented in brushed satin and a rear spoiler further enhance its sport car persona. To help maximize traction, there’s intelligent All-Wheel Drive with active twin clutch, that sends power to the wheel(s) that offers a solid grip in slippery weather conditions plus, it helps improve cornering and acceleration on dry roads. Regal GS offers stopping power that’s just as impressive as its heart-racing performance, thanks to Brembo® front brakes with dual-piston front calipers.